Yesterday, Samsung announced the Galaxy S7 and Galaxy S7 edge, both of which will be available around the world starting March. While we already presented the new features that the Galaxy S7 series is bringing, there's one thing that we didn't mention: the S7 and S7 edge will come with built-in caller identification and spam detection services from Whitepages (a US-based company that also works with T-Mobile in the US, providing similar features). 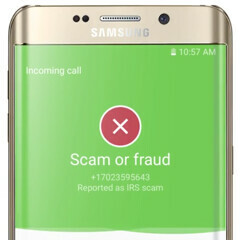 Thanks to an extensive data base (containing 600 million mobile and landline phone numbers in the US, and more than 1.5 billion numbers globally), Samsung and Whitepages will allow Galaxy S7 users to identify unknown calls, alerting them when a spam or scam call is incoming. Also included is a nearby business search feature that provides a quick way to find businesses - right from the phone's native dialer. For the beginning, the Galaxy S7 series will have these features in the following markets: Australia, Brazil, Canada, France, Germany, Hong Kong, Israel, Italy, Mexico, Philippines, Singapore, Spain, Sweden, Turkey, UK, and US. More countries should be added at a later date. Don't plan to buy a Galaxy S7 or S7 edge? No worries: Whitepages already has Android and iOS apps that offer the spam detection and caller identification capabilities that will be available on Samsung's new handsets - you can download them right now at the second and third source links below. Only uninformed consumers would buy this. Samsung phones are ridiculously overpriced for what they can do. the s7 does the same thing as every other $300 android phones. $700 is more than what apple is asking for for their entry level iphones. the marginally better hardware does not justify the premium over any $300 android phones. i will never buy a samsung over a nexus or iphone. you have no need to root your phone with iphone or nexus to remove bloatware you'd never have to run a custom rom, potentially exposing yourself to security backdoor to get rid of laggy touchwiz. i will never use mobile payment or mobile banking on a rooted phone on a custom rom iphone and nexus have google and apple engineers working around the clock to fix bugs and provide patches. it's not in samsung's best interest to update your phones timely as they only want to sell you the latest and most expensive phones. when they do update, they do it halfassedly by crippling your phone with only half of the new features available on their new flagships. google wants to lock you into their ecosystem so their best interest lies in providing you the best software experience. you'd be sure to get the latest features from google. unlike iphone and nexus, Samsung made different models for CDMA and GSM carriers in North America even though customers are increasingly paying full prices for their flagship devices. i think they intentionally did this for the carriers so they will aggressive push/market samsung devices while keeping their customers locked down to specific carrier. Google and Apple made all their devices universally compatible with all carriers (CDMA and GSM alike) you'd never have to worry about carrier compatibility with iphone or nexus as long as they are unlocked, which is important because carriers no longer subsidize their devices and there are many cheap and free MVNOs. If you value consumer choices, buy a nexus or iphone. if you want the latest tech but on a budget, buy a nexus, if you want premium, buy an iphone. It's crazy to me how many people were trolled by nexusX. Walked right into his trap. Looks like he likes the phone but can't afford it. Them again in his other posts he says: he doesn't like paying for app. Something is not right. Maybe he's a average Joe. i'm a chartered analyst. go google what that means. one does not become rich blowing $700 on a smartphone every year. even if that's your parents money. bloatware can be anything you dont want on your phone. This include apple watch app on iphone. Sorry. i understand the need to jailbreak an iphone to play free games. as far as performance is concerned, there is no need jailbreak an iphone. why would you ever need to root a nexus? So you spent so much time whining about a company you apparently don't care about! Makes perfect sense. Also please tell me how iPhones and nexus devices do more stuff than 300$ phones. As you seem pretty advances, also tell us how to remove bloat from nexus or iPhone without root, since you managed to do that. Did you word that wrong....? because a Nexus or iPhone can do more than most $300 dollar phones. I don't think he worded it wrong, it's a trick question. If the crybaby points out anything the Nexus or iPhone can do that a $300 phone can't, it most definitely can be done on the S7 too, so, he's knowingly lying in this case. If he doesn't point out anything, then he's being a hypocrite with double standards, discouraging sales of the S7 "'cause a $300 phone can do everything it can" yet encouraging sales of the Nexus and iPhone despite "a $300 phone being able to do everything they can". Yeah if he said a moto x play at 300-350$ can do anything an iphone ect can do then he would be right. all i'm saying there is no noticable performance difference between $700 galaxy s7 and $300 android phone. iphone is different because apple has their own ecosystem that is unrivaled. So you guys actualy read all this , damn you must have some time to waste. Anyway , seems like someone is butthurt :D.
I'm with you on this, don't want to read books at school. Surely, not going to do it in a blog. There's another guy here, he/her all they write are poems, geez. It's good to read. Seems like you wouldn't read anyone's 5 paragraph. Are you lazy? Or just don't like reading. Maybe he doesn't like wasting time reading 5 paragraphs of pointless idiocy. I mean, I wouldn't read 1 paragraph from Donald Trump. Sorry bud, its like comparing a Honda Accord to a Mercedes S-Class. I can't afford an S-Class but S7 Edge ---- Yeah baby !! So what do they need to upgrade in order to achieve non "S" upgrade status? It looks like they've upgraded pretty much everything but the screen New SoC, more ram, bigger battery, water resistant, better camera, external storage support That's a lot of major components upgraded. "Only uninformed consumers would buy this." > encourages buying the iPhone that still can't do stuff ancient dumb phones can...seems legit. Thjs is really boring to read! Why are you so much annoyed with the S7?? Because it's amazing and people are excited about it. No one cares if you buy it or not. You are saying Samsung devices are expensive compared to iPhones?..yeah lost me there, please provide information on production cost and pricing. You say Samsung engineers aren't working to fix stuff, again provide source? I know plenty of samsung phones that work perfectly years old, so yeah I don't quite see your point? and they aren't locked to carriers or anything else? Are you sure you aren't just a marketing bot, because you really sound like one. Xondk samsung S6 and note 5 are still pretty crappy for ram managements. Still waiting on android 6.0 thats i been rocking on my moto x play since months now. So yeah he made some point but was also very illogical on others points lol.